This Thursday, LaGuardia Community College hosted its fifth annual Black Lives Matter Summit, to discuss the importance of activism and reform. “We are in a desperate and problematic time in the history of this country,” King said, highlighting recent hate crimes such as the Pittsburgh Synagogue shooting. The October attack was the deadliest attack on the Jewish community in the US, killing 11 people. 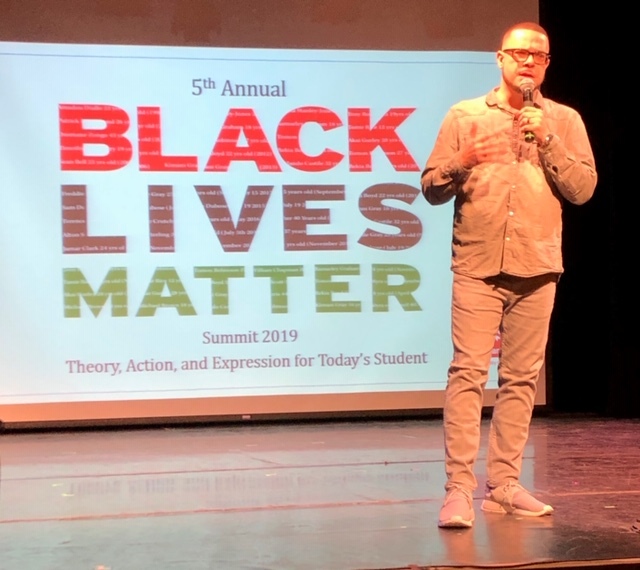 While speaking to the audience of college students, King discussed ways that young activists can bring about reform to combat inequality and injustice. Acknowledging the limited access to resources, King advised other ways that the students can cause change. He shared the importance of organizing highly energized people and devising a plan. In February, King relaunched the historic newspaper The North Star. The North Star was an abolitionist paper founded in the nineteenth century by writer Frederick Douglass. King says he faced challenges in the relaunch but he did not allow those obstacles to discourage him. “Don’t allow the possibility of failure convince you that you are not ready,” he said, hoping to inspire the room of students. Kingsborough Community College student Hilary Brown said she was inspired by this year’s summit. “Every day we see so many things wrong in this country, but we don’t know how to really help,” Brown said in an interview. “Being here today made me realize, I have to do more than just talk and tweet. I have to get involved. Charles Cooper testified before the Campaign Finance Board (CFB) as he answered a long list of violations slapped on him after his unsuccessful run for a seat on the City Council two years ago. He blamed a technology application used by his campaign and that app led to failure of transactions to be filed. He and his workers were unaware of the app’s shortcomings, he said. “If I had knew that, we would have never used that app,” he said. Cooper ran in a New York City Council district covering upper Manhattan, including Harlem. Cooper’s ten alleged violations included failures to document outstanding liabilities, report transactions, demonstrate compliance with cash receipts reporting and other required actions. In addition, he allegedly accepted contributions from corporations, accepted over the limit contributions, and had a petty cash fund greater than five hundred dollars. The CFB held its meeting on Thursday so that Cooper could testify, answering the charges against him. The CFB provides public funds to New York City Council candidates by using the matching funds program in which every $10 contribution from a New York City resident within the district that the candidate is running for will gain a $90 contribution for the candidate from the CFB. Candidates taking part in a campaign are required to document their expenses and assure the CFB that candidates did not misuse funds. Most of Cooper defenses had to do with asserted technological mishaps. He revealed that vendors such as UPS were unreliable in terms of the inaccuracy of their online tracking. When he looked for the tracking information, it had displayed the words “status not available,” he said. He also said that his campaign staff failed to provide alternative and simple filing options. “It takes a while to adapt to technology,” he said. Following Cooper’s testimony, the board determined that he must pay a total penalty of $5,296. Other candidates had been cited by the CFB. New York City Council candidate Alison Tan of Queens and Borough President candidate Everly Brown, also of Queens, did not appear at the board meeting. In the races two years ago, both candidates lost. The board determined that they had committed violations and assessed penalties for those violations. The candidates will be required to pay those penalties, which amounts to $715 in total for Tan and $6,725 for Brown. The New York City Council’s Committee on Environmental Protection held a hearing at City Hall on Thursday to vote on an agenda focusing on changing the New York City building and administrative codes in order to cut down on emissions. The committee has been working with building owners, architects, building experts and climate scientists for at least the last two years to come up with solutions in order to assist buildings in going green. This is not including the work that began with the passing of green laws as far back as a decade ago. Through their research, they’ve found that buildings account for approximately 70 percent of greenhouse gas emissions. The passing of this significant piece of legislation is the single largest carbon reduction effort in any city and will, in fact, pave the way for a twenty-first century green economy, councilmembers say. Aside from creating good middle-class jobs for New Yorkers, the bill will take approximately one million cars off the road by 2030. It will also make for measurable decreases in nitro oxide, sulfur oxide and particulate matter that fouls the air and contributes to higher than average asthma rates. Starting with the biggest and dirtiest buildings will put the city on the path of meeting the 40 percent by 2030 (40 x 30) and 80 percent by 2050 (80 x 50) goal. The New York State Energy Research and Development Authority (NYSERDA) has created the Property Assessed Clean Energy (PACE) Financing for building owners that will allow them a low interest loan to help cover the cost of going green. The property owner voluntarily agrees to repay the financing through a special assessment or special tax charge placed on their annual property tax bill. This provides financing for these types of improvements over time without requiring the property owner to make a large upfront investment. PACE financing is available through the Energy Improvement Corporation’s (EIC) Energize NY PACE program in participating municipalities. EIC is a local development corporation and a New York State nonprofit established specifically to assist local governments and property owners achieve long-term energy savings and/or generate renewable power for use on site. Building owners who choose to go green will see a net gain through energy savings due to using newer, more efficient technology. Outside of City Hall, environmental activists made their to the public. Rachel Rivera of New York Communities for Change painted a very distressing picture of what she goes through every day with her six children due to the aftermath of Hurricane Sandy. She shared a story of how she began hearing a cracking noise which led to the roof caving onto her daughter Marisol’s bed. The city’s new legislation states that New York City will start phasing out use of fossil fuel power plants and allow wind turbines to be built more easily in the city. These two things alone send out strong signals in the clean energy market that New York City is ready to phase out fossil fuels and convert to a greener grid. The plan is to do it in a way to give New Yorkers flexibility as it takes into account everyone’s contributions to city emissions in order to reduce building emissions. The climate emergency the city faces is leading legislators to say no to new fossil fuel infrastructure and new pipelines that will be operational for the next 30-40 years. The committee has an opportunity to make sure that there is a sustainable New York for generations to come. As time came to vote, the councilmembers were all too eager. 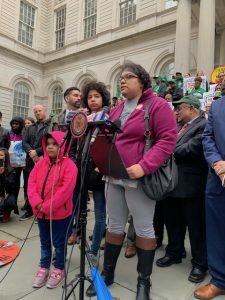 “I proudly vote ‘aye’,” said Councilmember Raphael L. Espinal, Jr.
“The climate change world has impacted our black and brown families, our workers on the waterfront so this is a proud moment for my district,” said Menchaca. “Happily vote ‘aye’,” said Councilmember Donovan J. Richards. Councilmember Kalman Yeger voted ‘aye’ on all but the unnumbered pre-considered resolution, to which he stated he was not for or against due to it not being introduced to the Council. Councilmember Eric A. Ulrich voted ‘aye’ on all without any additional commentary. The hearing adjourned with a vote of six affirmative and zero negative. His Eminence Cardinal Timothy Dolan and Director of Public Relations of Goya Foods Rafael Toro were joined Thursday morning by Catholic Charities of the Archdiocese of New York at the annual Holy Thursday Food Distribution, providing food pantry meals at Saint Rose of Lima Church. They were together to celebrate and to feed. Director of PR Rafael Toro announced the donation of 300,000 pounds of food, which will provide nearly 500,000 meals to New Yorkers in need. Goya Foods has been a generous supporter of the Catholic Charities’ food pantries, donating over 1.5 million pounds of food to Catholic Charities of New York since the start of its support. “No más palabras, tengo hambre (no more words, I am hungry),” said Cardinal Dolan. 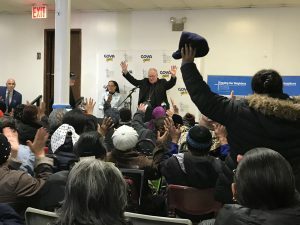 The annual Holy Thursday food distribution with Goya reaffirms Catholic Charities’ partnerships with programs to provide more than 4 million meals to hungry New Yorkers. Community and parish–based food programs and pantries offer non–perishable food for families to bring home, while many locations provide hot meals on site. 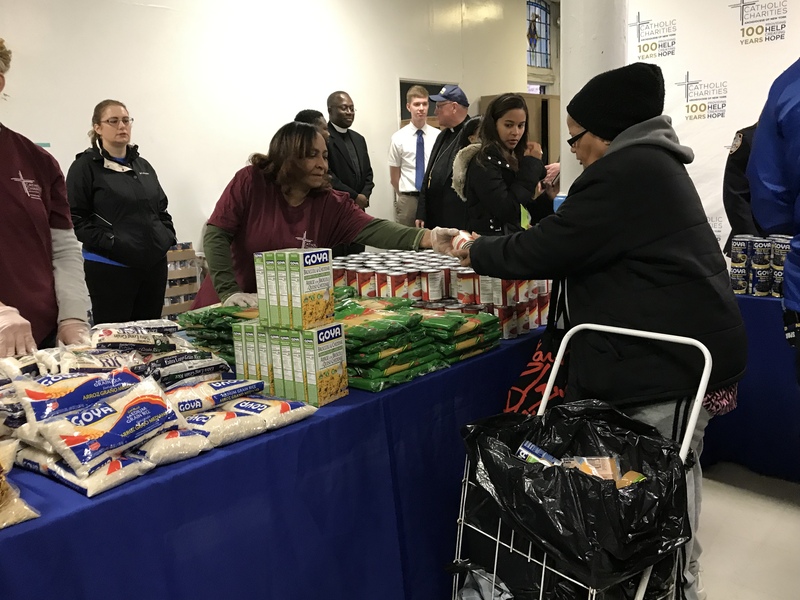 In 2018, Catholic Charities received 600,000 pounds of food, half of which Goya donated, translating to nearly 1 million meals that were re–distributed to their partner programs. The confetti flew high at the theater at Madison Square Garden Thursday morning, as the NYPD held its spring 2019 graduation ceremony bringing 457 new officers onto the force. In this class, 47 are military veterans. It is the biggest class since last July, when 726 graduates entered the department. These new officers are joining the New York City Police Department at a time when, according to Mayor Bill de Blasio, the crime rate is the lowest since the 1950’s. “The last time the crime rate was this low, the Dodgers were playing at Ebbets Field,” de Blasio said. Both the mayor and commissioner stated impactful the work of police officers is to the city. O’Neil sought to sooth the spirits of civil servants who will have difficult experiences ahead of them, and to make them happy and proud. “You will have some bad days, truthfully, but you will have many more good than bad days,” O’Neil said. Class valedictorian Christopher Messina, who is a fourth generation NYPD officer and among 124 officers who have family members in the department, gave thanks to his father who was his main reason he decided to pursue the NYPD. The future of flight in New York and New Jersey is a bright one, according to Port Authority Executive Director Richard Cotton. On Thursday, Cotton issued an official progress report of the Port Authority’s project to renovate the city’s airports and usher them into the twenty-first century. 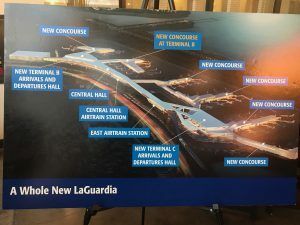 “Today’s discussion is not about planning, it’s about moving forward,” said Cotton, as he revealed the major renovations coming to the major New York and New Jersey airports. As for the airport itself, Cotton presented photos of a brand new concourse at Terminal B. The new concourse will be 250,000 square feet, hold 18 gates, as well as various concessions, and two airline lounges. As for JFK, that historic airport has fallen on hard times in recent years, its once high reputation having diminished quite a bit, according to Cotton. In order to make that happen, JFK will finally make use of one of its long abandoned terminals. The TWA flight center was opened in 1962, but closed in 2001 because it could not support the size of modern aircrafts. Although the terminal got stuck in time, it will not stay that way for long, according to Cotton. 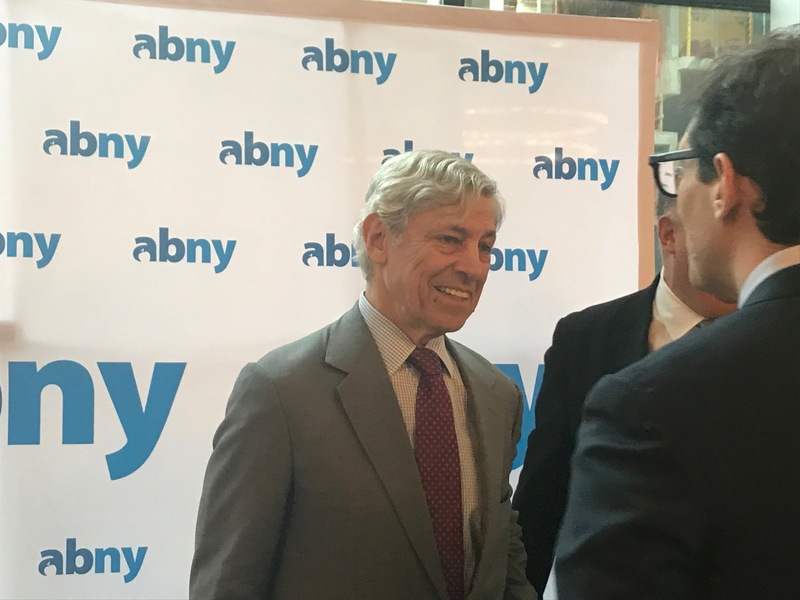 Cotton spoke at an event hosted by the Association for a Better New York, held at The Mezzanine, on Broadway in Manhattan. The Port Authority on Thursday revealed images for the TWA hotel, which is set to open on May 15. Not only will the new hotel increase public interest, but several changes to outdated terminals within the airport will increase productivity. “These changes will increase JFK’s capacity by 15 million passengers,” Cotton said. In New Jersey, Newark International airport is also due for a face lift, as three new terminals are planned to be added by 2022. Although the major airports were the focal points of Thursday’s presentation, Cotton emphasized that the Port Authority is looking to improve more than just the airports. He said he wanted to transform the entire travel experience. A new emphasis on the customer experience includes free and fast WiFi, family friendly services and amenities, and even food delivery directly to airport gates. After a presentation of groundbreaking innovations, Cotton reaffirmed the Port Authority’s primary ambition. 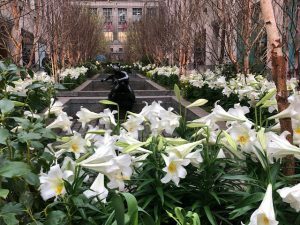 The bright and colorful Channel Garden brightens the surrounding area, even on a gloomy day like Thursday at Rockefeller Center. 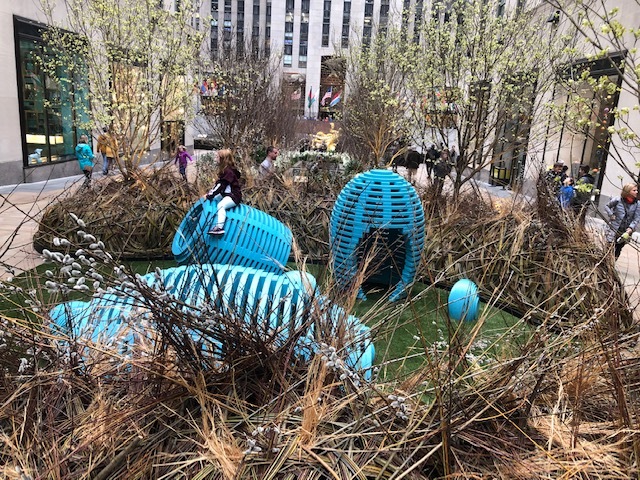 The tourist attraction has a new installation for Easter, a 20-foot bird’s nest and large blue eggs that children can go inside and play with. The section is small with amazingly green soft grass and gold birds over the nest, adding to the beautiful scenery. Although it’s surrounded by buildings and stores, the garden still brings a sense of peace and nature for those wanting to escape reality for a moment. 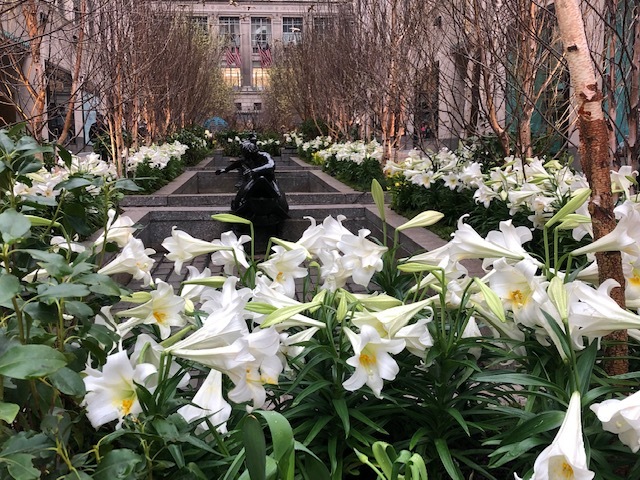 The unique and beautiful garden is part of a tradition of celebrating Easter in the biggest and brightest way possible. Every season, the garden displays exotic plants with gushy designs. The garden brings tons of tourists adding it to the list of many things they have seen in the Big Apple. A family of four from Brazil stood around on Thursday morning with their professional-looking camera, taking pictures of their children playing on the life-size eggs. Although there was a bit of a language barrier, the mother (Rauma) was able to give her opinion to this English-speaking reporter. Rockefeller Center was created by John D. Rockefeller (1839 – 1937), the founder of Standard Oil. He was the richest man in American during his era and he wanted to create a “city within a city,” which was Rockefeller Center. By 1940, the Channel Garden came into Rockefeller Center and it became a place where New Yorkers would congregate. Not much has changed over the decades. Well, not a lot. There are many more tourists in these recent years. They join New Yorkers coming to look at the constantly changing garden to see what’s new and take in the ambiance. On August 2018, a UN committee heard that up to one million Uighur Muslims and other Muslims groups were being detained in the western Xinjiang region of China, where they ‘re said to be undergoing “re-education” programs. 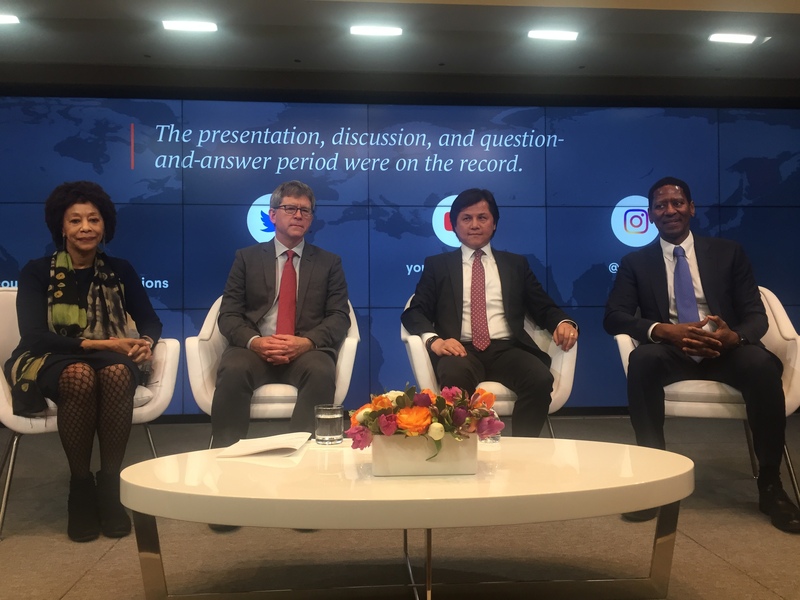 As the situation of millions of Chinese Muslims -detained in places that resemble concentration camps- is uncertain, the Council on Foreign Relations organized a lecture on the subject last Thursday. 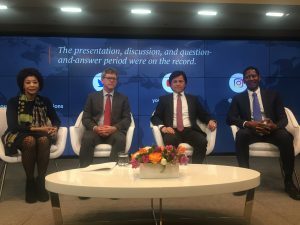 Invited to participate on the panel were: Ms Gay J. McDoughall, Vice Chair of the Committee on the Elimination of Racial Discrimination, James A. Millward, Professor of Intersocietal History at Georgetown University, and Nury A. Turkel, Chairman of the Board of Directors, Uyghur Human Rights Project. Presiding the panel was Calvin Sims, President and Chief Executive Officer at International House. It’s important to remember that this whole issue with the Uighurs and how they stay into the People’s Republic of China goes back to the 18th century, when this territory of Xinjiang was brought under the control of Beijing. Millward said that throughout the 20th century, The PRC never dealt with the issue of ethnic differences. He asserts that since decades, the government of China have been nervous about their own system of dealing with ethnic diversity, which he believes, is superficially modeled after that of the Soviets. “Particularly since 2008-2009 when there were very serious riots in Tibet and the Uighur region, there were great concerns that maybe the system was actually reinforcing ethnic differences rather than paving the way for a stable future in China”, Millward said. Millward mentions the invention of techniques and technology of state control reaching a new level in China. He said that in 2016 a new high tech surveillance system was put in place in the Xinjiang region to keep Muslims a and their activities under investigation. China’s president is really trying to unify Chinese identity, Millward says, and the cultural differences become a serious problem in the minds of Beijing. In this sense, the Ughirs are seen as a source of instability by the Chinese government. After the panel, many guests wanted to ask a myriad of questions to the panelists. Unfortunately, time went out most questions remained unanswered. Thursday’s event was in commemoration of the late Arthur C. Helton as a Memorial Lecture in his name. Arthur C. Helton was Director of Peace and Conflict Studies and senior fellow for Refugee Studies and preventive Action at CFR. He died in the 2003 Canal Hotel bombing while he was in Baghdad to assess humanitarian conditions in Iraq. The New York City Council Committee held a Housing and Buildings hearing on Thursday at City Hall, seeking out necessary information about the operation and safety of all elevators in the city. The committee is looking to bring up any and all parallels between general public elevators and NYCHA elevators, in order to remedy and eradicate all problems, so as to better service New Yorkers who rely on elevators every day. Many members of the committee have noticed the many inconsistencies with regulating general public elevators and NYCHA elevators as a whole. There is also a distinct difference in the training between NYCHA workers and those at the Department of Buildings (DOB), which often leaves NYCHA so far down the ladder, in terms of being able to detect and solve problems before and as they happen. There is a desperate need for standardizing the training for NYCHA workers, to match that of the DOB. Although elevators are put through thorough inspections every single year by the DOB’s 51 inspectors, they are still often found to not be running correctly which, at times, leaves passengers injured and afraid. When someone files a complaint to 3-1-1 for a general public elevator, a DOB inspector is sent out to investigate the issue usually within 24 hours. However, since NYCHA has its own complaint hotline and 3-1-1 is not involved, the DOB is very unlikely to come and it could be days later before the necessary party is finally contacted. The system that the DOB has in place is not a very trustworthy one for New Yorkers who depend on elevators that are a part of NYCHA since “the city has an understanding with NYCHA that’s been in place for quite some time, and that’s that NYCHA is responsible for, their own elevators,” said Assistant Commissioner of External Affairs Patrick Wehle. Another issue that needs to be investigated is the extent of verification of the elevator maintenance logs located in private properties, as well as NYCHA. “Are those logs being verified by DOB?” asked Councilman Mark Gjonaj. The response was that there is no oversight for private properties, only if there’s a complaint that triggers the DOB causing them to have to inspect the location. At this time, they will then verify that the logs are being maintained. Lastly, being that we’ve been living in the twenty-first century and are well up to speed on the latest technology, elevator modernization is inevitable. The question that remains is when will it happen. Throughout the questioning, the assistant commissioner failed to respond with a clear answer several times when the committee addressed possible issues with NYCHA elevators. These questions are to be included in a follow-up hearing in the near future. We have so many elevators in the city, general public as well as private. “The important thing is that they be maintained properly,” said Wehle.